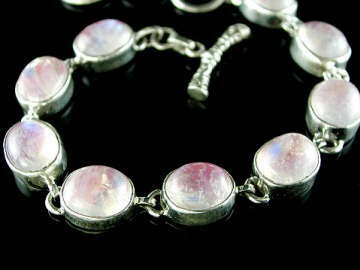 Rare and beautiful Pink Moonstone oval cabochon bracelet set in 925 sterling silver. This bracelet, set with nine excellent quality cabochons, has a gorgeous soft pink colour (far better than it appears in the photo). It has a beautiful ethereal glow to it and as you turn it in your hand, it comes alive with some electric blue flashes in the stones. It's finished with an ornate toggle-clasp with extension chain, so it will fit most wrists. Pink Moonstone is technically Rainbow Moonstone (see description below) and has all the same properties, but with its permanent baby pink, iridescent colour, it the perfect stone for all matters connected with the Heart and Higher Heart chakras. It can help restore the carefree innocence and joyfulness we felt as young children and is, therefore, great for inner child work. Pink Moonstone is still hard to come by. Rainbow Moonstone is the mineral Oligoclase from the Feldspar group. Moonstone and Sunstone are its commercial, or gemstone names (Sunstone being Oligoclase with Hematite inclusions, which give it its orange/red colour). So-called because in daylight it shimmers with an ethereal glow reminiscent of moonlight, Rainbow Moonstone has a very gentle, feminine energy. It is also known as the Wish Stone. It has been used to strengthen intuition and to heighten the psychic experience. Its rainbow energy, resonating with the whole spectrum, is a great cleanser on all energetic levels. It is one of the best protective crystals, instantly dispersing negative energies on contact. It can have blue, green and rarely, pink flashes. 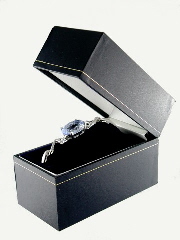 This bracelet comes beautifully presented in a faux leather box. We have matching oval cabochon drop earrings available in our 'Earrings' catalogue.